What does being "Home Alone" look like to you? With my hubby and son in Japan on soccer tour and the model daughter now living in Sydney, I've found myself home alone. Besides the initial whoop for joy which included some freestyle dancing in the lounge room (quickly followed by a flood of tears that were probably FOMO related) my life alone really doesn't look that different than it normally does. Who the hell am I kidding. Of course it's different!! The house is oh so very tidy without a thing out of place. Except for that thing over there, and that other thing over there. But that's OK, because they are my things and it's only other people's things that bug me. I'm a vegetarian. Without the need to cook for others I'm finding that it's easy for me to eat clean and green. Not because of anything conscious. I'm just too lazy to cook meat for one. I'm not interested in alcohol. I just don't feel the need to drink when I'm alone and I'm plenty fun without it. Refer to the whole freestyle dancing thing above. I sleep with dogs. The dogs are not allowed anywhere near the bedrooms normally, but when I'm home alone I accidentally leave the bedroom door open and I may even wake up with a snoring pug at my head. My music is loud. "Put your headphones on" is what I yell if someone else in the house is playing their music at volume. I mean, who wants to listen to that crap? Unless it's my crap and nobody else is home and then it's OK. I get so much done. Without anybody else's agenda to think about I am able to get a tonne of stuff done when I'm alone. I only have to wear one hat and it's my own. No taxi driver, Mumager, chef, household manager, soccer mum, psychologist, tutor, tailor ... Just Leanne being Leanne doing Leanne things. I cry freely. Sometimes it's because of a movie, other times it's out of frustration or worry, it may just be because it's time to cleanse, or perhaps it's because I'm alone. Whatever it is, I'll cry about it. I text a lot. Mostly to those who should be in the house with me but aren't. I freak out at every noise. The robbers and other baddies must surely know I'm home alone and hang around waiting for me to let my guard down. But my guard is not down suckers! I can hear every bump, scrape, ding and clank which makes for a very restless night (perhaps I should rethink point 3 above). Being home alone means I get to be the simplest and rawest version of myself. I can peel off all the layers and simply "be me". After 19 years of marriage and kids, it's kind of nice to ditch the group house for a few days and get reacquainted with my single self again. In fact, I've just realised I've never actually lived alone. This is quite possibly the longest time I've spent by myself. I went from home, to uni residences, to group houses, to living with a boyfriend, to renting out rooms in my own home, to getting married. 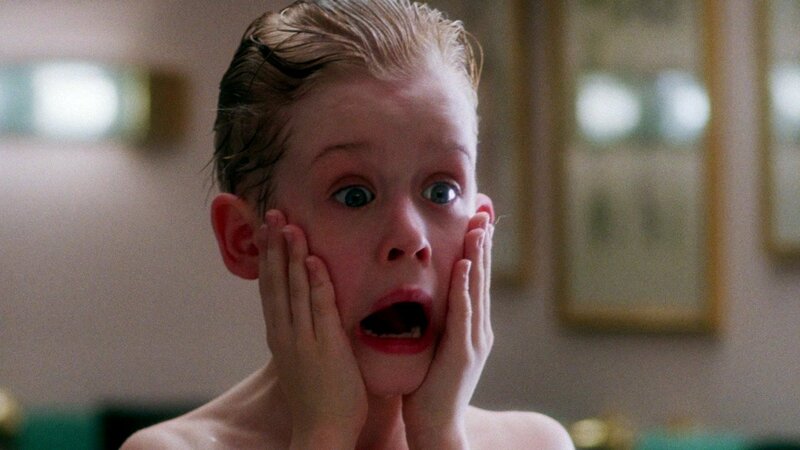 That relisation is reason enough to do the Home Alone face again. 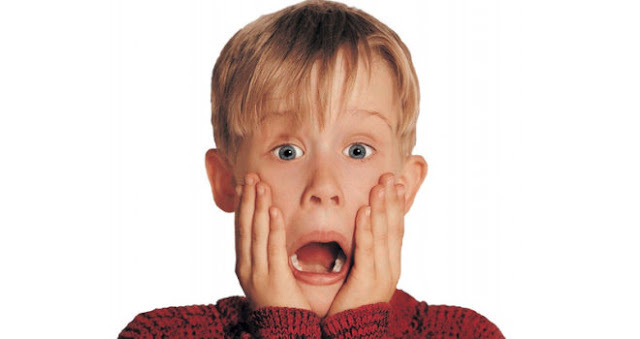 I'm home alone. And it's different. I'm different. Haha, I am much the same. Food gets simpler, TV gets soppier! I'm really really rarely alone at home and I miss it. For me it's the same... just a different level of peace. I watch a lot of chick shows when everyone is away - Jane the Virgin and Girlfriend's Gide to Divorce....and Asian action movies...love 'em. I am much the same as you. More green food, more chick flicks and more me time! Enjoy being home alone! Being home alone for a week or two would be absolute bliss! I'm not home alone very often (young kids will do that to you) but when I am it is all of things you've listed above (except for number 3, I don't really drink unless I'm on a night out so when I am home alone it's sometimes nice to have a glass of port after dinner when I know I'll actually get to sit and sip without interruption!